I’ve been wanting to add something to my recipe for Sauteed Cabbage for awhile now. Cabbage that’s cooked in a skillet with some onion and garlic is incredibly flavorful compared to eating cabbage that’s boiled. My mom used to boil it because that’s what everybody did and then she’d melt butter on top with salt, pepper and red wine vinegar dashed over it. And okay, it was delicious. But I think having more to do with a lot of butter, salt and the nice tang of vinegar than actually really tasting the cabbage itself… anyway, back to sauteed cabbage. When cabbage is sauteed in a skillet with other ingredients and cooked until it gets that caramelized edge, it’s quite tasty, not to mention more of the nutrients are preserved. A friend recently told me about Polish Haluski, and I knew I’d found my catalyst. Traditional Haluski is basically fried cabbage and noodles cooked in butter, sometimes with caraway seeds and some recipes also include meat. I decided to skip the meat but add mushrooms to still give it a rich flavor. A good helping of onions, garlic, and some fresh or frozen peas round it all out for a fresh taste and complex texture. For this version of Cabbage and Noodles, I used homemade style wide egg noodles. But any egg noodle or even gluten-free linquine works well. While the noodles are boiling I sauteed the mushrooms in an electric skillet and then added the onions. Once the onions are soft, half the cabbage gets added and cooked down just a little, then more cabbage and, of course, garlic, all the while, adding in a little olive oil and butter (you can actually sub in water for some of the oil and butter with excellent results). 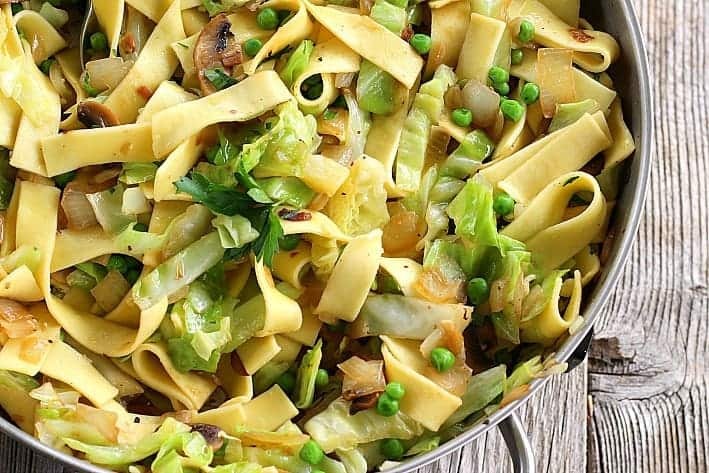 After the cabbage and onions have caramelized and the noodles are cooked, toss in the drained pasta with the cabbage mixture. Add how much works for your taste. My husband likes less noodles and more cabbage so there’s really no set quantities here. Then add in peas, plus garlic and onion powder for even more flavor. 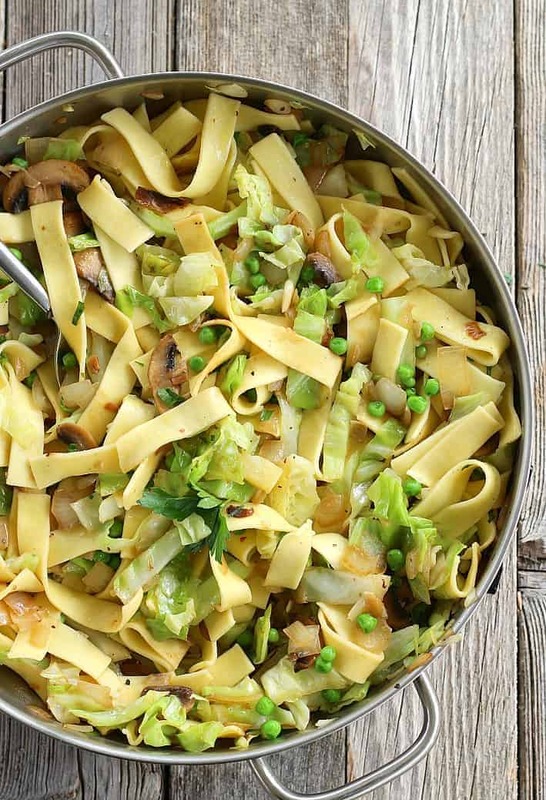 At this point, the Cabbage and Noodles are delicious and can be served with an extra drizzle of oil and some parsley. BUT… to make this dish even more flavorful and tender, place everything in a casserole dish or roaster pan, bake in a 300F degree oven for about 30 minutes and THEN serve it. This last extra step melds all the flavors into the pasta and it’s even more delicious. Also of note, this recipe is best enjoyed right after it’s finished. It’s still pretty good when reheated but not near as bright and flavorful. We enjoy Cabbage and Noodles as a meatless main dish but it’s also a great side dish to beef, chicken or pork. I give options for adding pancetta, ham, or bacon right into the recipe, too. Fresh, tender, and tasty! 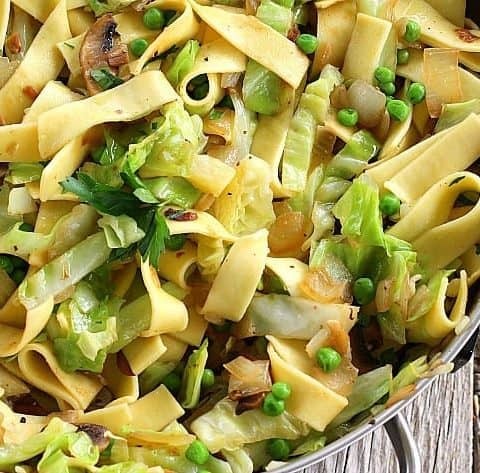 Sauteed cabbage and egg noodles are a perfect pairing in this tasty side dish or meatless main dish. Once all the ingredients are combined in the skillet, it's ready to serve but for even more flavor, cover and bake in the oven for an additional 25 minutes to help all the flavors meld into the pasta for an even more flavorful bite. Heat water in a large pot and cook the pasta according to directions. See recipe note #1 regarding different pasta choices. The pasta should cook while you prepare the other ingredients in next step. But watch the timing on the pasta if using gluten-free noodles as they'll be done before you're ready to add them into the cabbage mixture. NOTE: Save about one cup of your pasta water when you drain the noodles! In a large skillet, heat one tablespoon olive oil over medium high heat. Add sliced mushrooms and saute' until golden, about 5 minutes. If needed, add 1/2 tablespoon butter to help with browning. Add onions and cook, stirring occasionally, until onions are soft, about 3 minutes. Add chopped garlic and cook until fragrant, 30 seconds. Start with half of the cabbage and stir into the mushroom, onion mixture. Add one tablespoon of the butter and cook until the cabbage begins to brown. See recipe note #2 if wanting to add less oil. Add remaining cabbage and additional tablespoon butter. Add the granulated garlic and onion at this time and continue to cook, stirring until the cabbage has softened and browned around the edges. 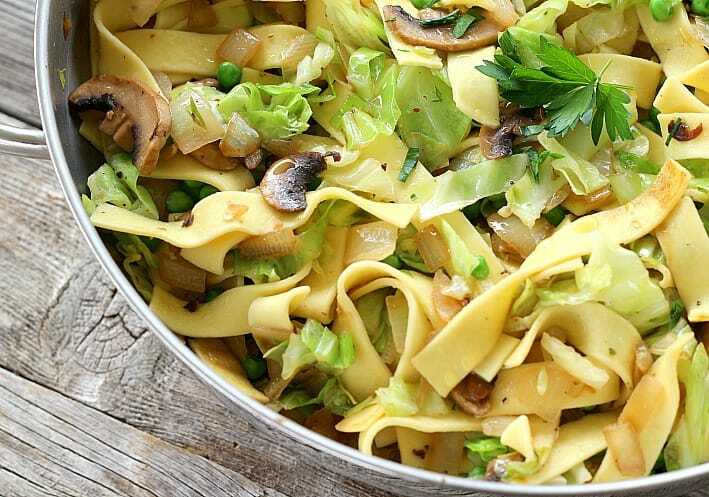 Once the noodles are al dente and drained (remember to save some of that pasta water), add the noodles a little at a time until you are happy with the ratio of noodles to cabbage. Add 1 teaspoon salt and 1/4 teaspoon black pepper, less if desired, taste and add more if needed. Add the peas and stir to combine. If you want the dish to be a little "creamy", add some of the pasta water, about 1/4 cup at a time until desired wetness is achieved. At this point, the recipe is delicious and may be served right out of the skillet. The cabbage and noodles are tasty for sure but to infuse even more flavor, place the mixture into a buttered large casserole dish or roasting pan, add up to 1/2 cup of the pasta water, cover with aluminum foil and bake in a preheated 300F degree oven for 10 minutes, remove the foil and continue to bake 15 minutes more. Baking in the oven helps to tenderize the noodles and cabbage a little more and infuses the onion and garlic flavors into the noodles. I highly recommend the baking step. Just before serving, whether you serve from the skillet or after baking in the oven, drizzle extra olive oil over the dish and sprinkle with the parsley just before serving. See recipe note # 4 regarding leftovers. Any favorite cooked noodles work great in this recipe, just use your favorite. If you're trying to cut back on the olive oil and butter, small additions of water work well except when cooking the mushrooms and onions. If you want to add meat to this dish, add diced pancetta (about 1 cup) at the same time as when you add the onions. You can also use sliced kielbasa, bacon or ham. This recipe is best eaten right after it's first finished. I've made it in the morning and reheated it the same evening and it is fine but not fabulous then. This recipe serves 4 as a main dish or 6 as a side. You may add more or less noodles to adjust servings to your liking. Made this several times already, with wild porcini we picked here in the Sierras. Love it exactly as is. Thank you. Tina, thanks so much for stopping by to let me know this. 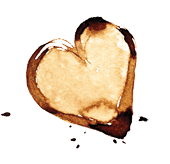 You’ve made my day and I’m so glad you like the recipe! Wow, fresh, while porcini mushrooms in the dish? Excellent! Easy, delicious, and healthy!!!! I’m already looking forward to the next time I make this!! Thanks Tami, I’m glad you liked it. I’m thinking about trying it next time with zucchini noodles. Since you turned me on to zucchini noodles, what do you think? Hi Jackie, I’ll go in and edit the recipe but it feeds 4 people as a main dish and 6 as a side.